The Southern Illinois University Edwardsville 2016 Kimmel Leadership Awards Ceremony, held Monday, April 25 in the Morris University Center Meridian Ballroom, recognized students, faculty, staff and community members for their outstanding contributions in leadership and service. More than 150 individuals and organizations were honored with such accolades as outstanding student leader and emerging student leader, rotary student leader of the month and organization, program and advisor of the year, among others. “Students who are involved in co-curricular experiences reap many benefits,” Stephen Hansen, PhD, interim chancellor of SIUE, told the audience. “Volunteer service and involvement in student organizations enhance academic development and complement classroom learning. Additionally, they help build leadership potential and foster growth and development. “The students, faculty and staff being recognized at this ceremony truly live the SIUE values of citizenship, integrity, inclusion, excellence and wisdom,” he added. Jaelen Deters, a native of Teutopolis, received the 2016 Kimmel Scholarship in recognition of her more than 600 hours of volunteer service and extensive involvement on campus. 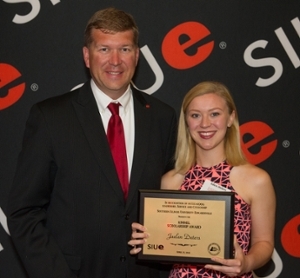 Deters is a senior majoring in social work in the SIUE College of Arts and Sciences. Her volunteer activities include two alternative spring break trips to Jamaica with SIUE. Deters is also a member of the AmeriCorps program where she is volunteering with the Good Samaritan House, a shelter for homeless women and children in Granite City. SIUE alumni Chad and Kathie Opel received this year’s Kimmel Community Service Awards for their impactful service and dedication to the community. The Opel’s organized the first Taste of Edwardsville in 2009, benefiting the Greg Seibert Foundation. In 2010, the two also established Neighbors in Need, a charitable organization that helps meet the immediate needs of local families facing medical crises. Photo: Jeffrey Waple, vice chancellor for student affairs at SIUE, celebrates the achievement of Kimmel Scholarship recipient Jaelen Deters. 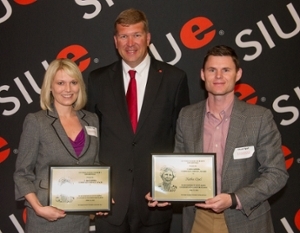 Kathie Opel (L), Jeffrey Waple, vice chancellor for student affairs at SIUE, and Chad Opel (R) at the Kimmel Leadership Awards Ceremony.